He's 'our's' and you gotta love it! As I’m reading some stuff on LGP today, I ran across the title of “Good ESPN.com article on Crosby”, so of course I have to read it. Well I did read it and it’s not only good, it’s GREAT. Hunger much? Yeah, Sidney Crosby being hungry isn’t a good thing for the rest of the league. If you think he’s good now when he was just ‘poised’, just imagine how good he’ll be when he’s poised AND hungry…scary. Awesome praise from a player that’s only been along his side for a couple weeks of training camp. Though it doesn’t surprise me that Crosby get can praise like that right away. He has that sense, or better yet ‘aura’ about him that stands out and glows. Fedotenko quickly saw that leadership in action. Very, very cool thing of Crosby to do. Not many captains do that and it’s an awesome sign of leadership from Crosby. Sometimes things so little like text messaging a new guy and welcoming him makes that player want to be here even more. Crosby’s text messaging isn’t limited to teammates. When Jonathan Toews was named captain of the Chicago Blackhawks this offseason, the 20-year-old forward got a surprise message from Crosby. From one young captain to another. Another thing that he does that makes you go “wow” and shake your head in disbelief. The generosity and willingness of Crosby to make people feel welcomed, not even on his team is just awesome. I wonder how many players/coaches texted him that were NOT Blackhawks…probably only a couple if not just Crosby. I think we all do that Brooksie. I never really thought about this that often but what Shero says is true. He’s 21 now and probably won’t even be in his prime for a few years. Believe it or not, he still has some developing to do (which is really, REALLY scary) and will continue to get better. Him, Ovechkin and Malkin will be in a league of their own in a couple years, as if they’re not already. 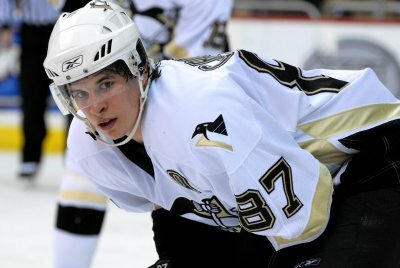 What I got from that article is that every Pens fan should feel fortunate for having him as our captain. He does everything right on and off the ice and he’s one hell of an individual. Add that he’ll probably bring a couple Cups to Pittsburgh as an extra bonus. This entry was posted on October 4, 2008 at 3:53 am and is filed under Penguins Articles. You can follow any responses to this entry through the RSS 2.0 feed. You can leave a response, or trackback from your own site.